As you design, do you get mostly caught up in the ins and outs of building code, review board and specification requirements and/or limitations? And how do you use these “limitations” as you design? Do they become issues that hamper and, piece by piece, chisel away at your initial design concept? Or, do you turn these limitations into a “game-like” mentality — where you think to yourself that these are mere guidelines that push you to think more deeply about your design, take it through another iterative level of creative thinking, ensuring that it meets others’ requirements, as well as your own. At times, efficiency can really help the business of architecture. But at other times, efficiency can be its greatest enemy. And this is why the notion of “play” (and knowing when to do it) is key. When designers play in architecture, they use their talents to compose a space in a manner that takes certain rules and “limitations” into account, but at the same time they do not let those rules and limitations overpower their instinct to think outside the box — that is, they think beyond the way architectural design for specific functions have always been designed, to rather, think into the future about ways that they could be designed, even though no one has done it that way…yet. When you “play” as you design, you usually enter into a type of “flow” state where you might imagine all of the various angles of your architectural space — imagining what it would be like for your client, your occupant, the review board and/or your consultants to experience that space (from their particular perspective). By embracing those rules and limitations brought on by all of the different eyes that must approve or use your architecture, you take on a game-like mentality where your architecture will have a better chance of standing out from the rest, meeting more of your occupants’ needs in more creative ways, and you will most likely get through your design process a lot faster. By stopping short of the rules…you give up on your chance to “play” as you design. And when you do this, your architecture will suffer, always falling short of what could have been. So, the next time you encounter a seemingly narrow and stifling limitation when it comes to your building’s design, stop and think of how you could possibly make that “limitation” work for you instead of against you. Take it from being a limiting factor, towards being a guiding factor that acts like a seed that gets you to see your own ideas in a different light. With this “game-like” mentality in mind, take a look at the following ten ways to use play wisely as you design an architectural building — helping you to turn limitation into inspiration. 1. Point of View — think about how your building might be perceived from an adult’s point of view as compared to a child’s point of view. What other scale sort of shifts might make you think differently about your spatial elements? 2. Metaphor — think of a metaphor that your architecture might communicate. What culture or community meaning might your architecture speak towards? How might such a metaphor impact its “sense of place”? 3. Movement — sketch a new way for your architecture to move. Ask yourself about the relationships between its static versus moving parts — the dialog between that which is full of motion and motionless. 4. Add to Your Palette — use light and material color to communicate something new to your occupants. Be sure you are aware of all of the sensorial properties exuded by the materiality you select. “Adding to your palette” may mean becoming more aware of the qualities that you may not be capitalizing upon fully in the lighting or materiality you select. 5. Surprise — use the element of surprise within your building. 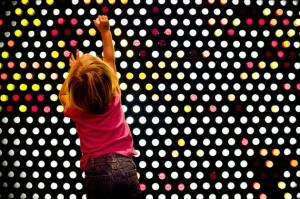 Design your building as a sensorial journey that presents a story to your occupant as they travel through its space(s). Use elements like surprise elegantly to awaken their senses as you present powerful architectural experiences. 6. Finding New Meaning — do the research necessary to understand your occupants and find out what holds meaning for them — then think of how your architecture might speak to those meanings. 7. Create a Language — use juxtaposition, time, or scale to create a language between the architectural elements: think variation, geometry or acoustics. Ask yourself how many languages your architecture exudes…or perhaps if their are sub-languages inherently within. 8. Sensory “Chord” Interactions — think of ways to provide sensorial “chords” — where the different sensory elements within your space are orchestrated to interact with your occupants synchronistically. Understand how they interact with each other from your occupants’ perspective, and use their variations to speak to your occupants through your architecture. 9. Find the Silver Lining in Rules — better understand guidelines or “limitations” by delving into their history or intended meanings. Then use this to further your design concept in such a way that it speaks to both your concept and its reason for being. Perhaps you can meet this requirement from a different angle. 10. Your Own Original Recipes — use your experience and expertise, playfully, as you brainstorm — for you may create new formulas within your own style, thus renewing your own originality.